How it made the Top 10: Living in complete darkness some 900-plus meters (nearly 3,000 feet) below the surface in the Lukina Jama-Trojama caves of western Croatia is Zospeum tholussum. This land snail lacks eyes as they're not necessary in the total darkness of the caves, and it has no shell pigmentation giving it a ghost-like appearance. Only one living specimen was collected in a large cavern among rocks and sand with a small stream of running water nearby, however many shells were also found in the area. 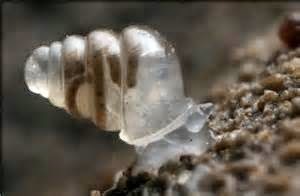 Even by snail standards, Zospeum tholussum moves slowly, creeping only a few millimeters or centimeters a week. Researchers suspect these small snails, measuring only 2 millimeters in length (0.08 inch), travel in water currents or hitchhike on other cave animals, such as bats or crickets, to travel longer distances. Etymology: The Latin word tholus means dome or cupola and refers to the remarkable dome-like shape of the second whorl. Reference: Weigand AM. 2013. New Zospeum species (Gastropoda, Ellobioidea, Carychiidae) from 980 m depth in the Lukina Jama–Trojama cave system (Velebit Mts., Croatia). Subterranean Biology 11: 45–53.